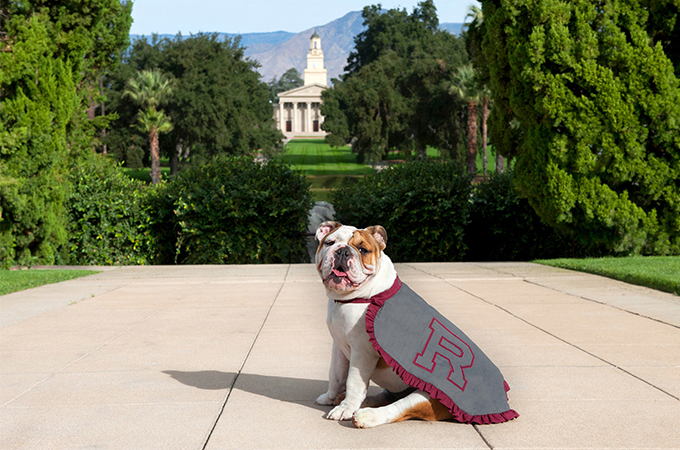 I have been having so much fun, it’s hard to believe it has been one year since I first joined the University of Redlands community as a nine-week-old mascot-in-training. To be clear, I am talking about one year for you humans, which, of course, is often counted as seven for my canine world. There have been so many great memories over the past 12 months, it definitely feels like seven years’ worth! As I launched into the mascot spotlight last June, I could not have begun to imagine how I would experience all the Bulldog sporting games, matches, meets, and community events, as well as my beautiful family and the kind students who volunteer to walk and watch me each week. There were dozens of dress-up days (luckily, I love my costumes), hundreds of thousands of steps during walks and events (I need a FitBit), and too many selfies to count (taken by the humans—they seem to have a thing about selfies with me)! 1. Meeting my buddy Thurber for the first time was a pretty special day. That Gallery Lawn felt so big, but when I laid eyes on Thurber, I knew I would be just fine. He was a pro at showing me the ropes, especially how to pose for photos. I miss him and hope I am doing his legacy justice—he left big paws (and skateboards) to fill for sure. 2. Homecoming in October marked my public debut, and what a weekend! After my Adoption Arf-fair, the Bulldog football game, and pumpkin carving, I was pooped, but it gave me a taste of how much I could boost people’s mood in my new job. 3. It’s not every day that you are venerated for the queen that you are, but on my coronation day on January 20, I accepted the honor of a memorable celebration as the University’s first female mascot, with an adoring crowd gathered in front of Currier Gymnasium. It was awesome, plus I got to wear a CROWN! 4. Valentine’s Day didn’t really interest me since I can’t eat chocolate and don’t care for flowers. But February 14 was the day my “boo,” Butler Blue, the bulldog mascot at Butler University, made our relationship “Instagram official.” Just thinking about it makes me pant even more than usual. 5. You humans always seem to go overboard for the first birthday party, and mine was no exception. On April 5, I got to wear a TUTU for heaven’s sakes! My University community came out to Hunsaker Plaza for cookies and birthday wishes. But I’m not just a pretty face—I am a canine with a cause! We held our Pet Adoption Event a few days later because not every animal starts out with a great home like me. But I looked pretty amazing in that tutu, didn’t I? So far, I am grateful to have been part of this loving University community for a whole (human) year. I have to admit that it still trips me out to see my face on socks or stickers, but there I am, on your feet, laptops, and Nalgene bottles, and adding that fashion je ne sais quoi, if I do say so myself. This summer, I am taking it easy as I prepare for my first fall as official mascot, but please know one thing—University of Redlands, you know how to make a girl feel loved! To request Addie’s autograph or make a tax-deductible contribution to the Mascot Fund, visit http://www.redlands.edu/adelaide. Download Addie's summer coloring page.